Looking to find the best rice cooker in 2019? You're in the right place. We've got 12 picks that you're going to love. Keep reading for the entire guide or click here to skip to the top picks. What Are The Differences Between All These Rice Cookers? Although all of these models cook rice, there are still quite a few differences between them. Most of them have one-year warranties and very few color options compared to other home appliances, so customization options are lower than in other kitchen machines. They all have components that can be removed from the cooking base and put through the dishwasher (aside from one unit) for easy clean-up, and they all have keep-warm settings that mean your rice won’t get cold if you take a little long getting to it after it’s finished cooking. They all have some accessories included – usually measuring cups and steaming baskets, which allow each model to steam other food while the rice is cooking. Rice is a great staple, and making it is easy with a rice cooker. However, that’s about where the similarities end. Within this line-up, there’s a range of different specs to choose from. Some models have much larger capacities than other – the Hamilton Beach model holds 14 cups of rice, for instance, while the Oster only holds six. Some of these models are stainless steel while others are plastic. Some have delay timers, so you can set up the rice cooker and have it start cooking just before you need it. And some have different functions that allow you to cook all sorts of things, especially the two pressure cookers, which allow you to cook all sorts of things apart from rice – including baking cakes! Do you live alone, or do you have a family of six? Do you eat a lot of rice or only irregularly? Are you planning on eating leftovers? Do you want to be able to make ﻿soups and stews? Do you want to make porridge in it? Are you having big dinner parties? Do you work a lot? How important is it that you come home to a meal that’s already made? 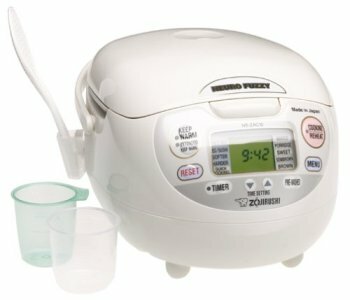 Do you want an Asian rice cooker that can do every type of rice to perfection? All of these questions will help you figure out exactly what kind of rice cooker you want. Smaller models are ideal for people who eat little rice or aren’t cooking for a crowd; larger-capacity models are for people with big families, big appetites, or who love leftovers. Get a model with a delay timer if you want to walk through the door to find your rice already cooked and ready to go. Go for something with functions if you want your oatmeal to be ready when you wake up each morning, or you want to make stews. It’s up to you what kind of rice cooker you want – luckily, there’s a whole lot to choose from here. The Japanese﻿﻿ ﻿﻿Zojir﻿﻿ushi ﻿﻿Micom Rice Cooker and Warme﻿﻿r is definitely the best model on this list in our opinion. It’s a great all-round machine that performs really well and has a host of functions that make even the relatively simple task of using a rice cooker even easier. It holds 10 cups of cooked rice, which is one of the biggest on the market, and represents approximately 10 servings of rice. However, you can of course use it for less rice if you require less; you just have the option of making 10 cups of rice if you need to. It has the classic features of top rice cookers: a delay timer, a keep-warm function, removable and dishwasher-safe components, and a steaming basket, which allows you to steam food at the same time as your rice is cooking. This allows you to make an entire meal in the machine at once. The best thing about this model is the massive range of functions that it has. While most rice makers will have one or two different settings – for white rice and brown rice, for example – this model has eight different functions: white rice/sushi, mixed rice, porridge, brown, sweet, cake, steam, and quick cooling. While many rice cookers are able to cook these things, this is one of the few models that has settings specifically for them, which means you don’t have to supervise the machine as it’s working to make sure things are cooking and not burning. The thing that’s most innovative about these functions is the ‘cake’ function, which allows you to bake a cake within your rice cooker. As far as I’m aware, no other rice cooker on the market shares this ability; it’s easier to make a cake this way than the traditional way, as you just need to put it in the container, push the ‘cake’ button, and come back when the machine beeps to collect your cooked cake. If you want a rice cooker that can do much more than just cook rice, this is a great model for you. It can steam foods at the same time as cooking the rice; it can make your morning porridge; it can bake a cake; and it can create perfect rice every time. It even comes with an extended keep-warm function, so if you make your rice a little too early, it’ll keep it warm for longer than other rice cookers on the market. It’s the perfect rice-cooker; Zojirushi has thought of everything in this machine, and it shows. May be expensive for some. The Oyama 7-cup rice cooker has a stainless steel body and comes with a stainless steel cooking bowl that has a triple layered base for uniform heating without the risk of burning your rice. There is also a setting to keep your food warm for extended periods after cooking, allowing you to keep it warm for up to 24 hours. This makes it ideal for large families with busy schedules or for couples who eat their meals at different times. Despite the non-stick coating, cleanup is a breeze and takes a short amount of time. Besides a sophisticated keep warm function and a three dimensional heating base, side and lid, there is a stainless steel steamer tray so that you don’t burn your rice. This is a great option for people who avoid non-stick surfaces as the stainless steel material means that chemicals don’t leech into your food. The steamer tray can also be used to steam vegetables (or any other foods that can be steamed or cooked). Besides regular white (sushi) rice, this gadget also cooks jasmine, basmati, Arborio, and other short grain rice as well as other grains like quinoa, buckwheat groats and oatmeal. This is a great choice if you’re looking for an all stainless steel model that is simple to use. If fuzzy logic is not important to you then this is a great device that will cook your rice to your desired consistency. 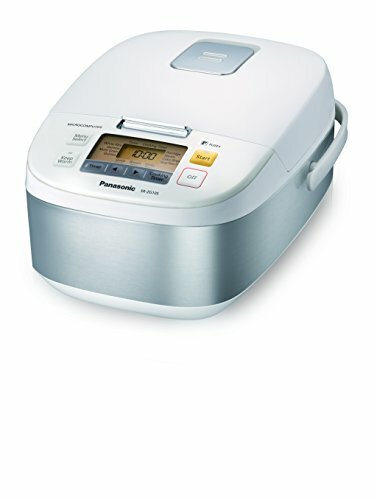 The Fuzzy Logic Pre-Programmed Rice Cooker is one of two of Panasonic’s Fuzzy Logic range on this list, and it’s also our top pick from the Panasonic range. The Fuzzy Logic models are named for the Fuzzy Logic technology, which is claimed by Panasonic to automatically adjust the power and cooking time during the cooking process to ensure that the rice comes out perfectly every time – a massive benefit, especially when cooking an uncommon grain (which is also possible with this machine). This model comes with an 8-cup container, which is roughly eight servings of rice – so plenty for an average family. It has a keep-warm setting and a delay timer, so you can time your rice perfectly for whatever you’re making. It also has a steaming basket, so you can make other components to your meal at the same time. Some things more specific to this model are its digital display, which shows just how long there is to go in the cooking process so you can time it expertly. There’s a domed lid to prevent moisture that’s evaporated from dripping back down into the rice and making it mushy, and this lid has a nice push-button release that clicks it into place. It also has eight different functions to choose from: white rice, brown rice, sticky rice, quick cook, porridge, cake, slow cook, and steam. These functions make it way easier to use your device for different grains – instead of hoping for the best when using your rice cooker to make oatmeal, quinoa, or sushi rice, you know that it’ll come out just right without you having to do anything at all. The slow cook function is also very cool, because it means that to some extent your rice cooker can double as a slow cooker – you don’t need to have both. The cake function is shared by very few other models, but it’s also a great addition, because it means you can cook a cake perfectly in the perfect size, and collect it when the beeper goes off – no more checking the oven to make sure it’s done. 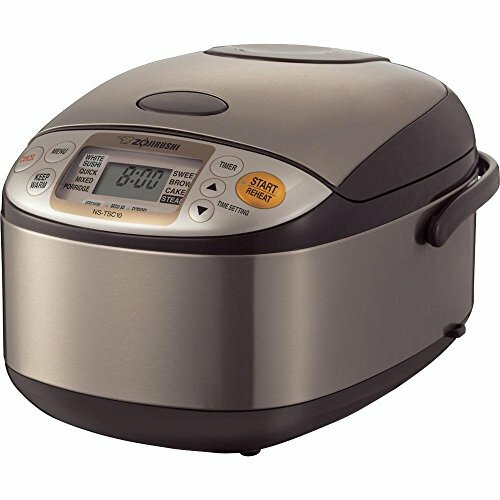 This is an excellent rice cooker, and definitely one of the best on the market. It has a great capacity, excellent functions, the ability to steam food while the rice is cooking, and an easy-to-use interface complete with digital display. If you want a machine that can double as a slow cooker and, to some extent, an oven, this is an excellent pick that’s sure to save you tons of time. May be too expensive for average household. The Hamilton Beach Rice & Hot Cereal Cooker is one of the best models on the list for a couple of reasons. It’s got the biggest capacity, at 14 cups of cooked rice, which is useful for if you’re cooking for a family or want the option to have leftover food for the next day - for this vegan fried rice, for example. Of course, you can use much less than that, which gives it the same usability as smaller models, but if you’re interested in making a lot of rice all at once, you can. It has a delay timer, a keep-warm function, removable and dishwasher-safe components (found from the manufacturer’s website here), and a steaming basket. This model comes with a few standard accessories: a steamer, a measuring cup, and a rice paddle for stirring. This machine has the second-most functions in this line-up: white rice, quick rice, whole grains, heat/simmer, steam cook, and hot cereals. It’s good for any sort of grain you’d like to put into it, which makes it a massively versatile machine and means you don’t need to invest in a bunch of different devices to do the same things. 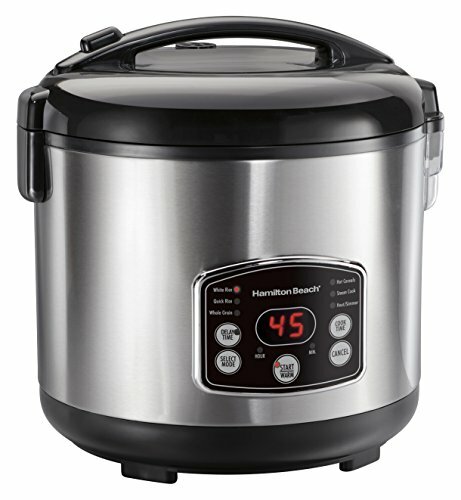 This is an ideal machine for if you’d like your rice cooker to act with some of the features of a slow-cooker, in terms of the heat/simmer function, and if you’d like a large capacity model for plenty of rice. There’s also a 20 cup version in case you need something even bigger! 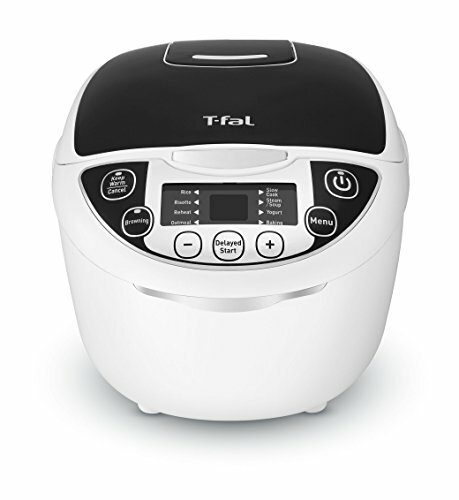 The T-fal 10-in-1 Rice and Multicooker is the only model on this list with a lifetime limited warranty -all of the other models have 1-year warranties. This makes it exceptional compared to almost all rice and slow-cookers on the market, and is a great sign of this model’s excellent build quality and great construction. It’s likely to be a very reliable model. Alongside this, it’s also the second model on this list that is not only a rice cooker but a multicooker. It can do plenty more than just rice, and actually comes with nine different functions: rice, risotto, reheat, oatmeal, slow cook, steam/soup, baking, and browning. It can be used to create almost anything you would want to make, and can replace a lot of different appliances in your kitchen, including an ordinary rice cooker, the oven, and a pan on the stove. As you can see, there's even a setting yogurt (we recommend soy yogurt) on it – something that is rarely seen in multicookers. These settings can be easily accessed through the simple push-button digital control panel. 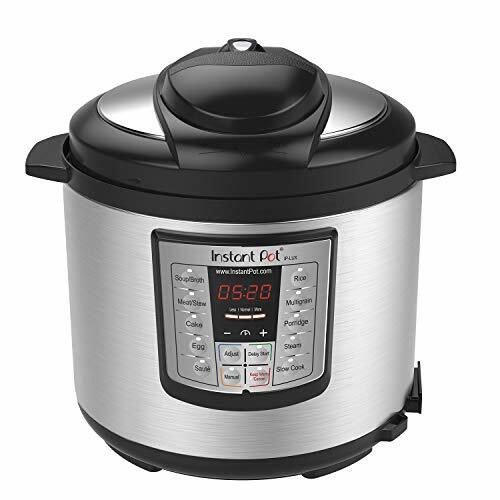 For other products with all these options - check out this guide: Power Pressure Cooker XL vs Instant Pot. It has a delay timer, so you can program the machine to start cooking exactly when you want it to, a keep-warm setting to keep your food heated while you prepare other things, and dishwasher-safe parts to make clean-up almost absurdly easy. It’s one of the best models on this list for this reason, and because of the Fuzzy Logic technology which, like one of the Zojirushi models, allows the machine to evaluate the cooking process to adapt the cooking time for perfect results ever time. If you want a machine that’s versatile, has a large capacity, comes with a range of useful accessories, and has an amazing lifetime warranty, this is the model for you. Has a lifetime limited warranty! Some may find it pricey. 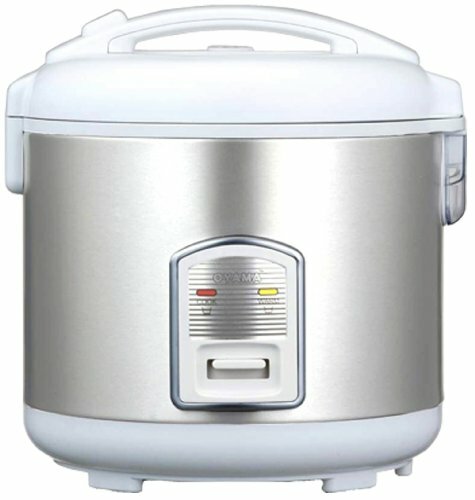 This is the perfect rice cooker for households with a lot of mouths to feed or for people who want to batch cook their rice for the week. This is an extremely robust, well-made machine that is worth every penny and comes with a one-year warranty. It comes with an aluminum inner pot and detachable stainless steel cover that are both easy to clean. It even features an auto steam-cleaning feature that facilitates the cleaning process even further. With one push of a button, you can do the majority of your cleaning using the steam cleaner and then wash up any remaining residue by hand. The high-tech 3D warming system means that you can keep your rice warm without it burning and sticking to the bottom of the pot. There is also a pressure cooking device, which allows you to control how much pressure you want to use when making stews, soups and other one-pot, beans and slow-cooked meals. The lock checking device is an added safety feature that stops water from splattering onto the kitchen counter, which is one of the most common complaints people have with cheaper rice cookers. This machine also boasts 11 cooking settings and 14 safety features. It uses fuzzy logic and has an automatic keep warm function that can keep rice warm for up to 24 hours. Besides brown, white and sushi rice, it also cooks oats and other grains. It even comes with English, Korean and Chinese voice navigation so you can choose whether you want to control it using your fingers or voice. 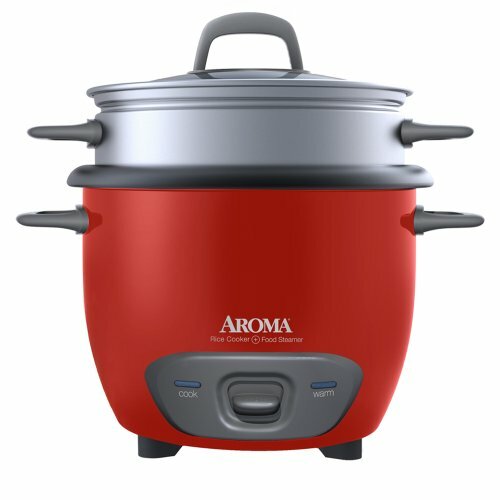 The first Aroma Housewares model on this list is the Digital Rice Cooker. It has many of the hallmarks of the rice cookers above, just at reduced levels: a big 8-cup capacity bowl, three different functions, a delay timer, a keep warm function, and dishwasher-safe components. The Aroma Housewares models come with the most accessories, and this one comes with five: a steam tray, measuring cup, serving spatula, soup ladle, and recipe booklet to help you get inspired when using it. 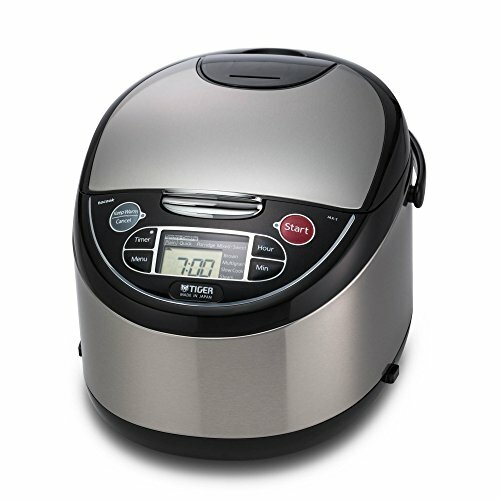 This model’s three functions are steam, white rice, and brown rice – very classic for rice cooker functions. Because brown and white rice take different amounts of time to cook, either way you can just press a button and let this model run. The keep-warm setting ensures that even after the rice has finished steaming, you won’t reach your fork in to find your rice gone cold. Unlike every other model on this list, the Digital Rice Cooker comes in two colors: stainless steel and white. While this might not be that important a consideration, if you like your kitchen appliances to be stainless steel, it’s a useful addition. This model is great for you if you like the free recipe book, want a moderately-sized machine with good specs, but aren’t quite ready to take the plunge into the higher-tier rice cookers – or maybe you just find their features unnecessary. A rice cooker’s job is to cook rice, after all – and this machine does it really well. The Instant Pot 6-in-1 Programmable Pressure Cooker isn’t specifically a rice cooker, but it has a rice cooking function that means it can do just as good as any other cooker on this list. As well as the rice cooking function, this machine has settings to cook soup, stew, bean/chili, saute, multigrain, porridge, and more. It's also got a steam and slow cook function (obviously). Because of this, it’s a lot more useful in many ways than a simple rice cooker, which you can usually steam food with, and cook various grains with, but which isn’t suitable usually for slow-cooking. It has three different temperature settings for various functions, and like many of the models on the list it has a microprocessor to adjust heating intensity and duration automatically. It comes with a delay timer, so you can load your pressure cooker with food and set it to a time at which you’d like it to start cooking, so your rice is ready when you get home. It also has a keep-warm setting and dishwasher-safe parts for super-easy clean-up. Because this model is also a slow-cooker, it’s best for someone who doesn’t already have one of these devices and is interested in them. It’s best if you’d like a machine that can do a range of things, rather than a simple rice cooker – so ideal if you’re someone in a rush, who doesn’t like to cook, or has a family to cook for. The Zojirushi Neuro Fuzzy Rice Cooker and Warmer is the second Zojirushi model on this list. It has some great specs for a rice cooker. It has a 10-cup capacity, which is big enough to feed an entire family, a keep-warm function to keep your rice warm while you do other things, and a delay timer so you can prepare your rice hours before you need it, and the machine will cook it when you need it. It also has a reheating function for if you accidentally leave the rice past the extended keep-warm setting length, or if you have older rice from the fridge that you’d like to make hot again. It has ten different functions: three for white rice (regular, softer, and harder), mixed rice, porridge, sweet, semi-brown, brown, rinse-free, and quick cooking. It also has Fuzzy Logic technology, which allows the rice cooker to adjust cooking temperature and time for perfect results. If you’re after a model that’s big and very efficient, with an LCD clock and timer and ten different functions that make cooking rice much easier, this is an excellent pick for you. Its only flaw is that it is not dishwasher-safe, but compared to all of the benefits it offers, this is not too big a deal. There’a also a smaller version if you don’t need the 10 cup! 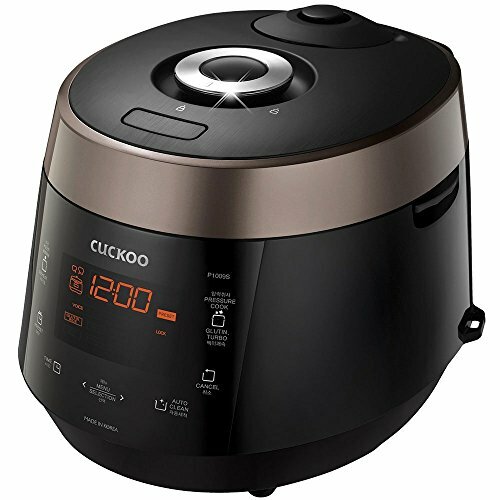 This 10-cup microcomputer controlled Tiger rice cooker﻿﻿﻿ and warmer with “tacook” synchro-cooking function is sturdy and reliable. Great for large families or people looking to batch cook rice. This machine also allows you to cook two dishes simultaneously which makes it super efficient at helping you get your meals ready in good time. It has 10 computerized cooking menu settings, which makes it extremely versatile. It can be used for many different things besides just cooking different kinds of rice (white, basmati, long grain etc) and is great at making oats, Japanese buckwheat groats and other grains like quinoa and amaranth. The device is easy to clean and the inner lid and steam cap is easy to remove and wash and includes a cooking plate and cookbook. Other features include a delay timer. The Oster Rice Cooker is one of a few Oster models on the market, and it’s a fairly classic rice cooker offering. It has a 6-cup capacity, which means it’s able to hold 6 cups of cooked rice – plenty for most families, assuming you don’t want leftovers. It also has a steaming tray, so you can use it to steam other elements of your food at the same time as it cooks your rice. Unlike the other rice cookers preceding it, this model and the following one do not have delay timers or any inbuilt functions. This isn’t necessarily a negative, if you’re planning on using your machine primarily for rice that you’re planning on eating soon – say, if you put on your rice cooker when you get home and start making dinner. It is a little more annoying if you’d prefer for the machine to make rice when you aren’t there, as it means you can’t just return home to a steaming hot container full of rice. It also doesn’t have any functions, so it’s not as good as making non-rice grains as other models; its timer is attuned to rice, so making oats or buckwheat or farro or any other grain in it will require your attention. White rice and brown rice will also cook differently, so you’ll need to adjust the amount of water you add to each to ensure they cook properly. 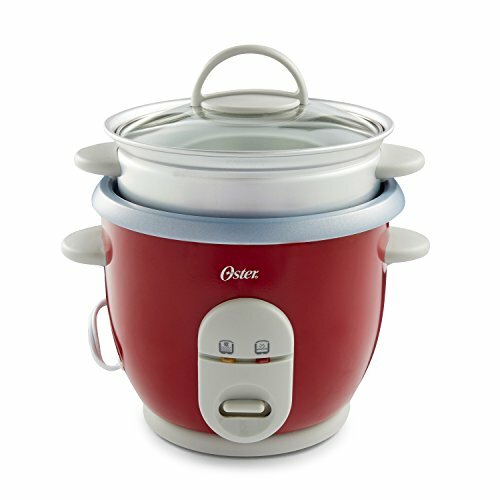 This model’s parts are dishwasher-safe, which is a massive advantage when it comes to cleaning up, and it has a keep-warm feature designed to keep your rice heated after the cooking cycle is complete. It just squeaks in as better than the following model because it also has auto shut-off, which means that it won’t keep using up power if you forget to turn it off, and it has a glass lid – so you can see just what’s going on in there. This is a great, classic model rice cooker that does a great job at the basics – so if you just want a model that’ll cook rice without extra features, it’s a great pick. 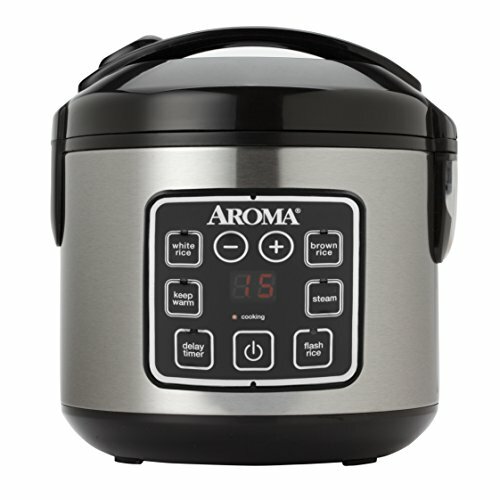 The Aroma Housewares Pot Style Rice Cooker and Food Steamer is an excellent rice cooker designed to give you exactly what you want – rice cooking – in a tidy, affordable package. Like the preceding model, it has a 6-cup cooked rice capacity that is ideal for smaller families or couples. It also has the keep-warm function, which stops your rice from cooling down after cooking is complete, and its removable parts are dishwasher-safe to make cleaning up very easy. It’s a fairly classic rice cooker, so it doesn’t come with any functions or a delay timer. As a result, it’s best used when you’re home, just about when you’re about to eat the rice that it’s cooking. Unlike other models, you can’t prepare your rice in the morning and come back to a pot full of steaming hot rice after work. Instead, you’ll need to put it on when you get home. There are also no functions, so like the preceding model you’ll need to pay a lot more attention when it comes to putting grains that aren’t rice into your machine to make sure nothing goes wrong. This model comes with a steam tray, so you can steam food while cooking your rice, a measuring cup, a spatula, and a recipe book to give you inspiration in the kitchen. It’s a great model for if you’d like a classic rice cooker that just works, without splashing out for more extra features. It does its job, and it does it really well. The best of these rice cookers, which are the top rice cookers on the market already, is the Zojirushi Micom Rice Cooker and Warmer. This model has the most features (including the ability to bake a cake!) and it comes with a large container so you can make plenty of food all at once. These, combined with a delay timer, a keep-warm function and dishwasher-safe accessories, make it our top pick (best of the best) for rice cookers on the market today. Instant Pot Smart vs. Duo vs. Duo Plus vs. Lux vs. Ultra | What’s the Difference?